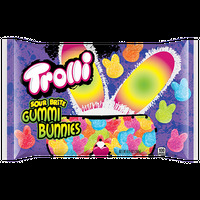 Trolli gummy bunnies. Fruit flavored chewy gummy candy in the shape of little bunnies. Each box has an assortment of fruit flavors and 5 colors. You will get clear, red, orange, green and yellow colored bunnies in sweet flavors that trolli is known for.